Plan a visit to Historic Stockyards City in Oklahoma City today. Start your day in Historic Stockyards City bright and early with a breakfast burrito or taco from Taqueria Los Comales. Load your tortilla up with early morning standards - bacon, sausage and potato - or spice it up and dig into more traditional flavors like machacado or chorizo. If breakfast on the continental side is more your style, stop by Panaderia La Herradura (“The Horseshoe Bakery”) for a pan (Mexican pastry) and coffee. Over the last two decades, the Montoya family has built a solid customer base by churning out excellent traditional breads like pan dulces, conchas and abrazos at their family bakery. Burn a few calories after that hearty breakfast and take in some classic red brick architecture with a hike up Exchange Avenue to check out the Stockyards. Time your visit just right and you can even take in a live cattle auction. Launched in 1910 with the founding of two packinghouses, Stockyards City became the first industrial power house for the fledgling capital city, generating jobs and casting Oklahoma as a hub in the national cattle market. As the packing plants grew, the district became fully self-contained, featuring its own streetcar service, post office, restaurants, hotels and ancillary businesses to accommodate ranchers from all over the world. 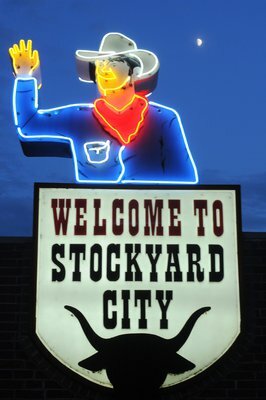 By the 1970’s, Stockyards City had grown to become the largest stocker/feeder cattle market in the world. Now that you’ve ticked a visit to the Stockyard proper off your list, freshen up for a full day of shopping at Prairie Dust Soaps & Stuff. With a full line of house-made soaps, artisanal candles, luscious body balms and body care products; Prairie Dust warms the heart of Cowtown like a sunny day in February. No stranger to hard work and craftsmanship, Shorty Koger, the only female hatter in the whole industry, cut her teeth shaping hats at rodeos before getting into the hat-making business nearly three decades back. Satisfy your inner junker with a stop at the Rusty Chandelier. This eclectic boutique features a well-curated selection of vintage home goods, art, plants and even clothing that embraces the Rusty DIY mantra of rip, refurbish and repair. Round out your wardrobe with some proper Western gear from Langston’s, 4W Western Wear and Western Wear Outlet. In addition to a broad selection of boots from all price points, this trio of Western shops also features a dizzying array of denim, snap shirts and hats. When lunchtime rolls around, head on back toward the stockyards and grab a table at the Stockyards Café. While the menu is filled with honest Southwestern diner favorites, you should really consider ordering up one of their blue-plate specials, each one is scratch made and paired with choice of two sides and a roll. No matter what the choice, you'll savor the authentically down-home flavor of this small town café. Now that you’ve got a fresh pair of jeans and a crisp snap shirt, it’s time to step up your boot game with a post-lunch visit to Little Joe’s Boots. Founded in 1950, Little Joe’s carries an amazing selection of handmade boots. In addition to their custom boot lines, the shop is also the exclusive Oklahoma retailer for many heritage outdoor brands like White’s Boots, Filson and Stormy Kromer, so be sure and pick up that perfect gift for your favorite outdoorsman. Take your hat game to the next level with a visit to Shorty’s Caboy Hattery. No stranger to hard work and craftsmanship, Shorty Koger, the only female hatter in the whole industry, cut her teeth shaping hats at rodeos before getting into the hat-making business nearly three decades back. Expect exceptional craftsmanship at Shorty’s, along with important features like measuring each client’s head, creating a personalized head block and handcrafting your hat from top-quality beaver felt. Get a mid-afternoon pick-me-up with a stop into Stockyards Sarsaparilla. Whether you prefer root beer, sarsaparilla or cream, you can pick your favorite soda from over 350 different types at this old-fashioned sarsaparilla bar. The shop also features a fun selection of homemade fudge and nostalgic candy. Once that sweet tooth has been tamed, spend some time perusing one of OKC’s premier American Indian gallery shops, Oklahoma Native Art & Jewelry. This thoughtfully curated space features a broad spectrum of rare work from nearly 70 well-known artists including painting, jewelry and horsehair pottery. A full day of shopping merits a great steak, so get your reservation in and settle down for a classic Oklahoma steak dinner at the legendary Cattlemen’s Steakhouse. Opened in 1910, this iconic steakhouse has fed generations of hungry ranchers, cattle haulers, celebrities and even a United States President or two! Enjoy your steak with all the trimmings, but be sure and save some room for a slice of their homemade pie - fruit or cream pie. Finally, cap off your day of fun in Stockyards City by gearing up in your fresh western gear and heading over to the Rodeo Opry for a family-friendly evening filled with live music and entertainment. Through the years many Oklahoma greats, including Bryan White, Cody Canada, Wanda Jackson, Byron Berline and Reba McEntire, have graced the stage of the state's official country music showcase.